These two accent lights have a brushed steel finish and are perfect for lighting a range of areas in your home. Highlight art work or architectural elements, light a plant or brighten a dark corner of a room with these sleek uplights. - 8" high x 4" wide x 7 1/2-foot cord. - Uses either a 50 watt R20 or a 60 watt type A bulb (bulb not included); on-off rotary switch on cord. - Set of two accent uplights from Pro Track. - Ideal for use as a decorative light to accent plants or room details. - Includes black cord and plug. 8" high x 4" wide x 7 1/2-foot cord. Uses either a 50 watt R20 or a 60 watt type A bulb (bulb not included); on-off rotary switch on cord. 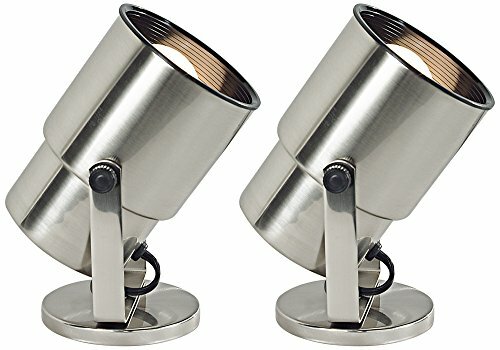 Set of two accent uplights from Pro Track.